Sheet Metal Workers International Assn. Metal workers originally made tin men to advertise their trade and wares, later using them as teaching tools for apprentices, since the skills needed to make a tin man are those a journeyman must master: layout, scribing, cutting, folding, rolling, bending, riveting, soldering, and filing. 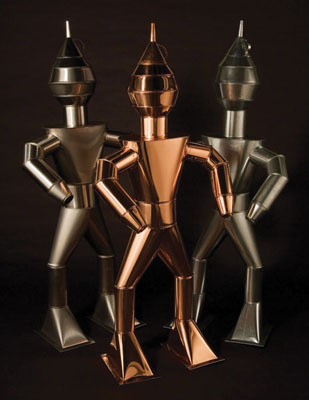 Today, much of a sheet-metal worker's labor consists of heating and ventilation ducts so constructing tin men gives traditionally trained workers the opportunity to make their formidable skills visible. Four retired sheet-metal workers spent more than fifty hours each fabricating these tin men: Richard Clarke, Daniel Hardy, Glenn Walker, and William Walsh.